Heavy smoke (flaming campfire) and a salty sea breeze take over the command immediately. The aromatic intensity is considerable, I honestly did not expect that in the form. Sweet fruit notes gradually penetrate the initially dominant smoke of the wild Islay malts. Salty caramel, gentle sweet sherry notes, dried orange peel, lemons and blueberries follow. Strong spices (nutmeg & cloves), oak and dried tobacco leaves are mixed with smoke and fruity notes. Pleasantly complex! Soft and full-bodied onset. 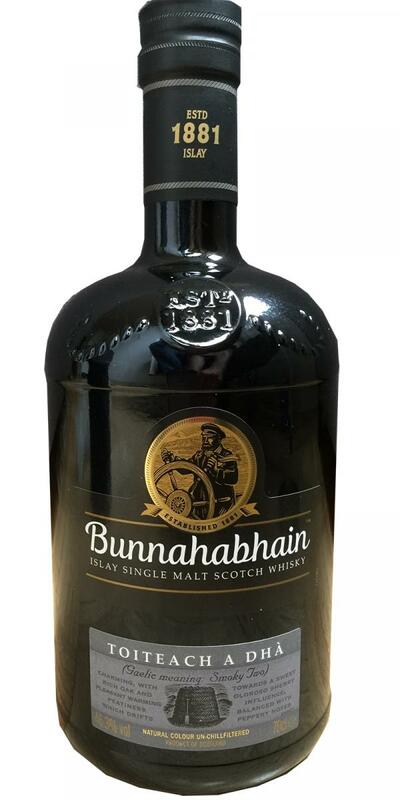 The Bunnahabhain rekindles a blazing bonfire and a fine sea breeze. The Sherrynoten gain in taste in presence and dominance. Overripe apples, orange peel, grapefruit, raisins and sugared wild berries create a sweet and fruity contrast. Christmas spices, salty caramel, dark chocolate, spicy oak and fine tobacco notes complete the harmonious taste. The alcohol content (46.3%) fits very well into the overall picture. I renounce the addition of water. Medium to long, smoky-spicy and warm. The Sherrynoten now give way to the more ashen smoke and clear traces of pepper, salt and chocolate. 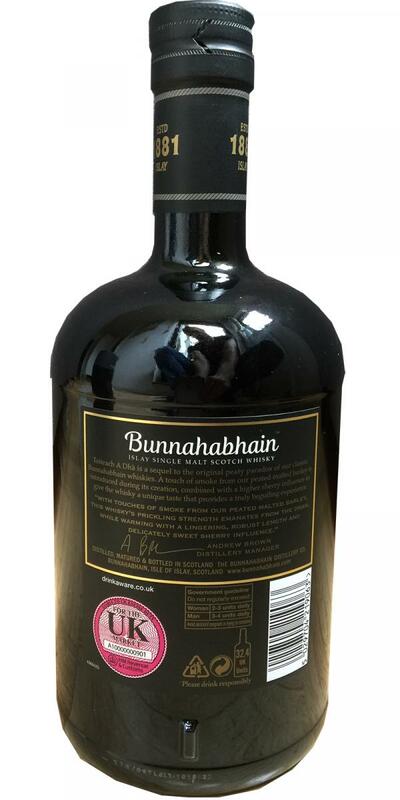 Strong oak notes, Christmas spices and tobacco let the Bunnahabhain slowly fade away. A slight dryness remains on the palate. But hello, he can do something. That's when I thought that was just another of those "okay" bunna no age statements. But no. He has depth and character and gets out back not thin and boring, but holds beautiful long the variety of aromas of the nose and tongue upright. At the price - you really can not complain. A pleasantly restrained smoky note that draws with a touch of dried apricots, peaches and raisins in the nose. Sherry aromas follow after a while, as do caramel and honey. Spicy wood, a little tree resin and pepper complete the picture. Cool peat smoke, more intense on the tongue than in the nose. Dry from the beginning. Sherry aromas, some Kellermoder and an impression of damp wood give it depth. Cloves, nutmeg and pepper crowd in. Also a little licorice and menthol resonate. Nougat chocolate, freshly brewed coffee, leather. Medium long, dry. In the finish he continues to show the flavors of the tongue. Although in a weakened form, but as a whole they are still there. Anything but one-dimensional. An unusual but good malt! Unusual but very interesting nose - the mouthfeel falls off and can not keep up. Unusual smoke (frankincense), cooling nose - menthol, minty and citrus fresh, licorice, barely honey sweet, you have to look for the few Sherryoten. Initially closed and not very expressive, cool. Light sweetness and smoke develop, caramel, hints of honey. Medium. At first mild and sweet, the tannins soon take over. Dry smoke on the tongue to the end.